Hi! Welcome to This Wife Cooks! Today, we’re cooking up a beefy but vegan version of a very popular chain restaurant appetizer. Skip the crowds and the wait by serving up this easy and tasty dish right in the comfort of your own home! 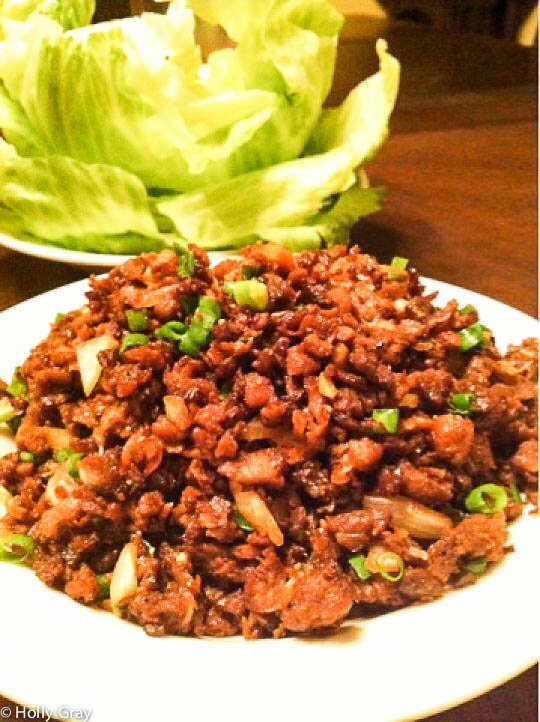 And since I think of lettuce wraps more like little Asian tacos, (I love tacos so much I even wrote a recipe book on them) they’re served as the main course in my house. Add in a side of Egg Drop Soup or some roasted veggies and you’ve got dinner on the table in 30 minutes! Hungry for more? Follow me on Pinterest for lots of meatless meal recipes and ideas! In a medium skillet over medium-high heat, brown the ground beef in olive oil. Remove from skillet, drain if necessary, and set aside. To the skillet, add the onion and cook for a about a minute or so, stirring frequently. Add the garlic, soy sauce, hoisin sauce, ginger, vinegar, and chili sauce and stir to combine. Add the green onions, sesame oil, and cooked beef and heat through. Spoon into lettuce leaves and serve warm.